A professional fax image browser viewer & fax to tif tiff converter which enables you to browse, open, view, flip, mirror, print almost ALL kinds of fax images. FaxSee Pro is a professional fax image browser viewer & fax to tif tiff converter, enables you to browse, open, view, flip, mirror, print not only known-format fax images such as black-white tif tiff, faxwizard faxman fmf, winfax fxd fxm fxr fxs, BitFax bfx, B&W dcx bmp, quick link qfx, APRO MightyFax apf, CALS Group IV (Type 1) img cals cal gp4 mil oda ras, Microsoft at work document awd, Zetafax g3f g3n fax, Image Systems ig4, Kofax Ascent Capture ds, Xerox Edmics-mmr ed fax, etc, but also other group 3 (T.4) and group 4 (T.6) compressed fax images such as gtx, zgf, smp, raw, g3, g31d, g32d, g4, mh, mr, mmr fax, etc, and able to convert ALL these fax files into tiff images. Note: awd fax is supported on win2000/xp/2003, not on win9x/winMe, and you need download awd patch (it's free) and install it before you can convert awd fax on win2000/xp/2003. 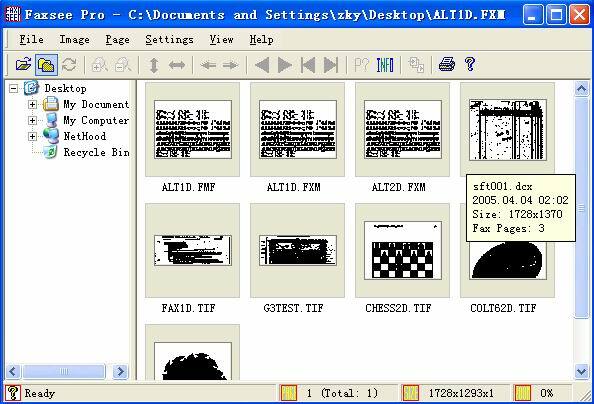 open and view Fax Images: you can open fax images of almost ALL kinds of fax images with faxsee pro, such as black-white tif tiff fax, fmf, fxd fxm fxr fxs, black-white dcx bmp, bfx, qfx, apf, img cals cal gp4 mil oda ras, awd, g3f g3n, ig4, ds, ed, g3, g31d, g32d, g4, mh, mr, mmr, raw, fax, etc. Browse fax images in thumbnail viewing mode. You can easily switch between thumbnail viewing mode and single image mode by double click mouse. Print and print preview Fax Images: you can print the displayed fax images with faxsee pro. Convert Fax to tif tiff: you can convert all these fax files to tif tiff files. Rotate fax images: you can Flip and mirror your fax images in faxsee pro. Advanced fax detection parameters can be set to control fax detection. Slide Show ALL your fax images one bye one after clicking mouse only once. Shortcut (Mouse right button) menu in single image mode enables you operate your fax image quickly. FaxSee Pro is a professional fax image browser viewer & fax to tif tiff converter which enables you to browse, open, view, flip, mirror, print almost ALL kinds of fax images.